An old Sanskrit word to describe universal love is 'anouraag ', which can also be used to explain the content of Ranajit Sengupta and Miguel Guldimann 's forthcoming album. The two musicians met in Germany in March 2005 and continued work for three years, both travelling back and forth between Germany and India. A preview of the album was given at a concert hosted by the Calcutta School of Music. Anouraag showcases the ease with which Indian classical music and Western style of playing can be presented on the same stage without being called "fusion artistes ". 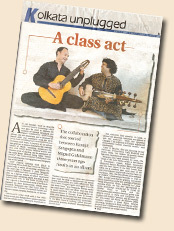 The Swiss musician Guldimann was heard playing the 8 string guitar and Sengupta was at the sarod. Their chance meeting took place in Wurzburg where both had concerts. What followed was a series of informal sessions. On his next tour to Munich in 2005, Sengupta coaxed Guldimann into recording a few samples on a laptop, results of which impressed them to start Anouraag. Early next year, it was Guldimann 's turn to visit India. During their 2008 sojourn in Switzerland most of the tracks featured on their forthcoming album were recorded. Sengupta says they have tried to maintain the richness of classical Indian and Western music, keeping fusion out of the studio. Guldimann 's earlier work with a few other Indian musicians helped him understand the nuances of our music. "Silence is important in Western classical music; these are moments that could be used to incorporate my music. Every composition is a joint effort and they have been changed again and again over the last three years, " says Sengupta. Eleven tracks are ready and "there are ideas " that may lead to more numbers. The concerts they present in India or abroad are identical, tracks are not altered to suit the audience. "Only the sequence changes. The audience in Europe enjoys and understands Indian classical music, " says Guldimann.